An Indian take on a traditional burger. This tandoori lamb burger recipe can be made-ahead and frozen. Mix all the ingredients for the burgers in a large bowl. Season with salt and pepper, cover and chill for 1 hour. Using wet hands, shape the mixture into 10 burgers. Place them flat between sheets of baking paper in a rigid freezerproof container. Freeze for up to 3 months. Defrost the burgers completely in the fridge. Heat a griddle pan or barbecue to hot. Brush both sides of the burgers with oil and cook for 3-4 minutes each side or until well browned and cooked through. Meanwhile, use a vegetable peeler to cut ribbons of cucumber. Place in a bowl with the red onion, lemon juice, the sugar and salt, and leave to stand for about 10 minutes. Toast the naan breads. Top each naan bread with some onion and cucumber. 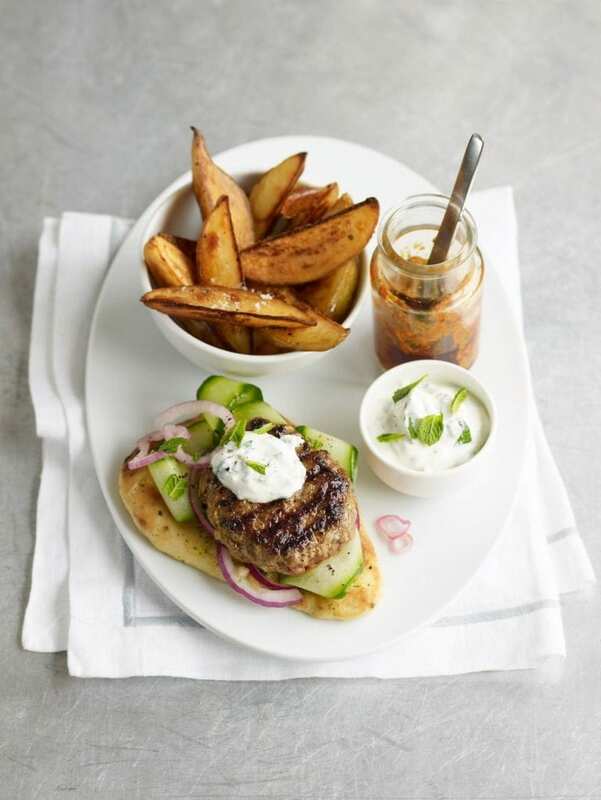 Add the burgers, a dollop of mint raita and sprinkle with mint leaves. Serve with spicy potato wedges, extra raita, garnished with more mint, and lime pickle.